Pulwama attack live updates: Prime Minister Narendra Modi on Friday said that the security forces have been given full freedom to give a befitting reply for the Pulwama terror attack which killed at least 40 CRPF jawans. PM Modi said that the forces behind this act of terrorism and those responsible for it would pay a 'very heavy price' and had made a 'big mistake'. He said that security forces have been given permission to take decisions about the timing, place and nature of their response. "There's a lot of anger in the nation, the blood is boiling. I understand it….Our forces have been given full freedom. I want to tell terrorist groups and their leaders that they have made a big mistake, they will have to pay a huge price. I want to assure the country that the powers behind this attack and those responsible will be punished for their actions," PM Modi said earlier in the day. He said that if our neighbour, which is totally isolated in the world, thinks it can destabilise India through its tactics and conspiracies, then it is making a 'big mistake'. Union Home Minister Rajnath Singh also said the country would avenge the dastardly attack carried out by Pak-sponsored Jaish-e-Mohammed. On Thursday, in one of the deadliest terror attacks in Kashmir, a CRPF convoy of 70 vehicles was targeted by a Jaish-e-Mohammed suicide bomber, resulting in the death of 40 jawans. Heads of various countries have expressed condolences over the Pulwama attack. India slammed Pakistan for the attack and blamed it for supporting Jaish-e-Mohammed and its founder Masood Azhar. Pakistan issued a statement rejecting India's attacks. The Jaish suicide bomber, identified as Adil Ahmad Dar, rammed an SUV laden with over 3000 kg of explosives into the CRPF bus carrying about 40 personnel. Catch all the live updates on the Pulwama terror attack on BusinessToday.In's live blog. 11:13 pm: Pune Rural Police has arrested a Junior Ticket Collector, Kumar Upendra Bahadur Singh, for allegedly raising pro-Pakistan slogans during an event to pay tribute to CRPF jawans who lost their lives in Pulwama terror attack, ANI reported. He has been suspended by the Railways. 10:50 pm: Talking to India Today, CRPF DG RR Bhatnagar revealed that a new dimension was added to terrorist activist in Kashmir as an explosive-laden vehicle was used to target a convoy for the first time in the Pulwama terror attack. Calling for new effective counter-radicalisation measures, Bhatnagar said that police will definitely hunt down terrorists who plotted this attack. 10:45 pm: Mortal remains of some of the jawans will be taken to Prayagraj in Indian Air Force's C-17 aircraft, from where they will be taken to different locations in eastern India. Another C-130 aircraft will take the mortal remains of other jawans to Pathankot. Some mortal remains will be taken to different locations in Uttar Pradesh, Haryana and Uttarakhand by road. 10:40 pm: "The response of the international community in condemning this barbarous attack in one voice will strengthen our resolve to fight this menace," the former President of India said. 10:40 pm: "I'm extremely pained by this act of inhumanity perpetrated by terrorists. In this hour of grief, we must stand together as a nation. The united front put up by political parties and politicians across the spectrum is a sight of that unity," says former President Pranab Mukherjee. 10:33 pm: Prime Minister Narendra Modi pays tribute to the soldiers martyred in the Pulwama terror attack. "We salute you, brave sons of Mother India. You lived for the nation and served the country with unparalleled valour. We stand in solidarity with the bereaved families," PM Modi said on his Twitter handle. 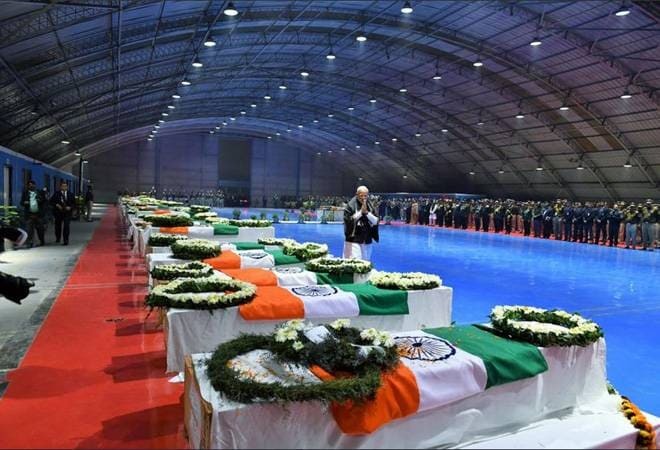 10:25 pm: The Punjab government has announced that it would accord a state funeral to the four CRPF personnel from the state, who died in the Pulwama terror attack, officials told India Today. The four jawans from the state included Jaimal Singh of Dharamkot, Moga, Sukhjinder Singh of Tehsil Patti, Tarn Taran, Maninder Singh Attri of Dinanagar, Gurdaspur and Kulwinder Singh of Anandpur Sahib, Ropar, the official said. 10:15 pm: Vice President M Venkaiah Naidu on Pulwama attack: It is a matter of concern that political discourse is reaching a new low in recent years. We should reverse this trend at the earliest. People in public life should understand that they are only rivals, not enemies. "We should consider each one of our friends, who are in different political spectrum, our rivals only. It is only competition, healthy competition that is required," ANI quote Naidu as saying. 10:10 pm: All prior commitments of Defence Minister Nirmala Sitharaman for tomorrow and day after tomorrow have been cancelled. She will go to Tamil Nadu and Karnataka to pay last respects to the CRPF jawans of the two states, who lost their lives in terrorist attack in Jammu and Kashmir, ANI has reported. 10:00 pm: Earlier in the day, a candlelight march, organised by Ladakh Buddhist Association, was taken out in Leh in protest against terrostist attack in Pulwama, ANI has reported. 9:55 pm: Police and CRPF personnel has said this could not have been a one-man operation. "There is a high level of planning and expertise involved," India Today has reported. 9:45 pm: Sources said that the IPS Association of Uttar Pradesh has decided to contribute one day salary to the families of martyrs who lost their lives in yesterday's terror attack in Pulwama. The amount will be sent to the CRPF Headquarters in Delhi via CRPF Frontier Headquarters, Lucknow. 9:30 pm: A day after terror attacks on security forces in Kashmir, West Bengal Chief Minister Mamata Banerjee on Friday questioned the Central government on whether there was a major intelligence failure that resulted in the biggest ever attack in Pulwama. "I feel there was intelligence failure, I spoke to many people and most have said the same. Why were so many vehicles sent together?" she told India Today. "After Pathankot it is a big incident. It is most unfortunate but how did it happen? What is the National Security Advisor doing? What has happened is wrong and we have a right to know," she added. 9:15 pm: NIA team and forensic experts have collected materials required for forensic evaluation of the scene of crime. Considering the status, team would continue with sifting of material tomorrow too, ANI reported. Outcome would be made known after analysis is over. 9:10 pm: India's Deputy High Commissioner Gaurav Ahluwalia leaves Pakistan MoFA in Islamabad after he was summoned by the Additional Secretary Asia Pacific over the allegations of Pakistan's direct role in Pulwama terror attack, as per media report. 9:00 pm: A very strong demarche was made to the Pakistani High Commissioner by the Foreign Secretary earlier today, suggested media report. As part of continuing diplomatic efforts to isolate Pakistan after Pulwama attack, Foreign Secretary has met around 25 Heads of Mission based in New Delhi today from all P-5 countries, all South Asian countries and other important partners like Japan, Germany, Republic of Korea and others, sources said. 8:35 pm: PM Modi arrives at Palam airport and pays homage to the 40 slain soldiers. Lata Mangeshkar's mesmerising song 'Ae mere watan ke logon...' is playing in the background as leaders pay tribute to brave hearts. 8:30 pm: NIA team with suitable forensic component reached Awantipora to help the Jammu and Kashmir Police in forensic evaluation of crime scene, ANI reported. 8:25 pm: Defence Minister Nirmala Sitharaman, Home Minister Rajnath Singh reach Palam airport. They will pay tribute to slain CRPF men at Palam airport. 8:15 pm: Congress president Rahul Gandhi pays homage to the CRPF jawans killed in the Pulwama terror attack at the Palam airport. 8:00 pm: Sources said that PM Modi has asked BJP MPs and ministers in BJP governed states to attend last rites of CRPF jawans, who lost their lives in Pulwama attack, in their respective constituencies and states. 7:50 pm: Chief Minister Arvind Kejriwal-led Delhi government has cancelled all its official programmes on Friday as a mark of respect towards the 40 CRPF personnel killed in Pulwama attack. 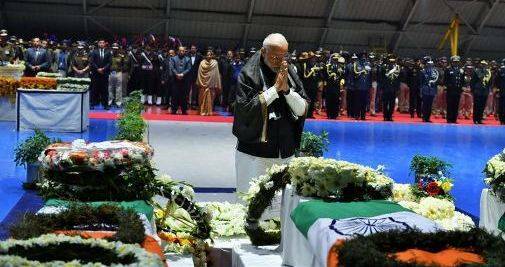 7:45 pm: Prime Minister Narendra Modi is likely to pay his last respects to slain CRPF men at Palam airport. The mortal remains of CRPF jawans reached Delhi's Palam airport a few minutes ago. 7:30 pm: The mortal remains of CRPF jawans arrived at the Palam Airport. The wreath-laying ceremony begins. 7:25 pm: Congress President Rahul Gandhi is on his way to Palam Airport where the mortal remains of CRPF jawans are being brought today. 7:15pm: MEA meeting ends: Representatives from South Korea, Sweden, Slovakia, France, Spain, Bhutan, Sri Lanka, Afghanistan and Nepal were present at Ministry of External Affairs. 7:10 pm: Maharashtra Chief Minister Devendra Fadnavis announces Rs 50 lakh will be given to families of martyrs who lost their lives in yesterday's terror attack in Pulwama. 7:05 pm: Uttarakhand Chief Minister Trivendra Singh Rawat announces Rs 25 lakh will be given to the martyrs' families from the state. 7:00om: Union Mininster Piyush Goyal: "Our armed forces and people of India are competent to give a befitting reply to such forces. Our jawans will ensure that any forces which are enemy to India's interest get a strong rejoinder and people of India will continue to give confidence to them." 6:45pm: Initial probe has revealed that there was no use of RDX in the Pulwama attack. Sources said that a very fine quality of urea ammonium nitrate was used in the IED blast in Pulwama. The chemical substance is commonly used in stone quarries in Kashmir. 6:00pm: The Prime Minister Narendra Modi has called an all-party meeting on Saturday at 11 am in the Parliament library. 5:50 pm: Union Home Minister Rajnath Singh, who reached Srinagar on Friday morning, has said that the Centre has requested state governments to extend the maximum help they can lend to the families of the martyr. "I've given all the necessary directions to the officers. The morale has not taken a hit. We'll see this fight against terrorism to the end," he said during a press conference. Targeting separatists, Home Minister said that there are some elements who are hand in glove with terror organisations, terror forces and the ISI across the border. "They are involved in terror conspiracies too. They are toying with the future of the people, especially the youth, of Jammu and Kashmir," he said. "In the wake of suicide attack on CRPF convoy yesterday, it has been decided that the civilian movement will be stopped for sometime when a large convoy of security forces passes through an area." He passed on this information after meeting with the Army Commander, DG CRPF and other senior officers. Mumbai's Shri Siddhivinayak Temple trust has announced Rs 51 lakhs as a help for the families of CRPF personnel who lost their lives in terrorist attack in Jammu and Kashmir. 5:20pm: Media report suggested that MEA officials are reaching out to all important partners through diplomatic missions in wake of terrorist attack in Pulwama to apprise them of involvement of Pakistan backed terror groups. In yet another ceasefire violation along the LoC, Pakistani forces resorted to shelling in Poonch district of Jammu and Kashmir today. Sanjay Raut has said that Shiv Sena has demanded a joint session of Parliament to hold discussions over yesterday's Pulwama Attack. Shabana Azmi on Pulwama Attack:"I am filled with pain and grief and all else ..by the dastardly #Pulwama attack . For the 1st time in all these years I feel weakened in my belief that people to people contact can force the Establishment to do the right thing.We will need to call halt to cultural exchange as of now. There is no way we can carry on when our martyrs are laying down their lives are for us. I stand in solidarity with the grieving families." 4:40pm: Ghulam Dar, father of the suicide bomber, told India Today that he did not know anything about his terror links. Jaish-e-Mohammed terrorist Adil Ahmad Dar was identified as the suicide bomber who carried out the attack. "He was a class 12th dropout. He disappeared in March last year. Since then we came to know that he has joined militancy. Yesterday, we were informed by the police that he has been killed." 4:35 pm: Home Minister Rajnath Singh helped carry the coffin of a slain CRPF jawan before it was flown out of Jammu and Kashmir in a special aircraft, an official present at the function said. Before this, he laid a wreath on the mortal remains of the troops, who were killed in a terror attack in Jammu and Kashmir on Thursday. Among others, Jammu and Kashmir Governor Satya Pal Malik, Home Secretary Rajiv Gauba, CRPF Director General R R Bhatnagar, Jammu and Kashmir DGP Dilbagh Singh were also present at the wreath laying ceremony. 4:30pm: The commerce ministry may soon notify to the World Trade Organization (WTO) its decision to revoke the most-favoured nation (MFN) status to Pakistan on security grounds, PTI quoted an official as saying. This would allow India to increase custom duties on goods imported from Pakistan. In 2017-18, India imported goods worth USD 488.5 million from Pakistan. 4:00pm: Indian High Commissioner to Pakistan Ajay Bisaria will leave tonight for Delhi for the consultations tomorrow, sourced told ANI. 3.55pm: Jharkhand Chief Minister Raghubar Das has announced an ex-gratia of Rs 10 lakh for the family of a CRPF jawan from the state, reports PTI. 3.51pm: India calls its High Commissioner to Pakistan, Ajay Bisaria, to Delhi for consultations. 3.47pm: Uddhav Thackeray on Pulwama attack: "Every citizen has only one reaction that enough of this rhetoric. Take decisive action once and for all. These attacks have exposed our intelligence network. If we are not getting information about the possible attacks, then what the intelligence services are doing? What the people at decision making level are doing? (The govt should) remove them, if they are unable to do their job." 3.38pm:India initiates process to revoke MFN statusto Pakistan. The commerce ministry will write to the World Trade Organisation (WTO) conveying India's request to withdraw the MFN status to Pakistan by invoking Article 21 of WTO, which is called the Security Exceptions Article. 3:21pm: Visuals of Union Minister Rajnath Singh and J&K DGP Dilbagh Singh lending a shoulder to mortal remains of a CRPF soldier. 3:20pm: A petition moved in Delhi High Court seeking to issue a direction to the press and electronic media to use 'respectful words on the martyrdom of soldiers' : ANI. 3:12pm: Slogans of 'Veer Jawan Amar Rahe' raised at CRPF camp in Budgam after wreath laying ceremony of soldiers who lost their lives in the Pulwama attack. 2:55pm: Afghanistan President Ashraf Ghani said in a press statement, "Terrorism is a cancer in the region, and it requires collective efforts to root it out." 2.45pm: Lyricist-screenwriter Javed Akhtar and his wife and actress Shabana Azmi have cancelled their scheduled visit to Karachi. They were invited to appear for a programme on poet Kaifi Azmi in Pakistan. 2.40 pm: Union Home Minister Rajnath Singh has reached Srinagar. He is likely to meet top security officials later today to take stock of the situation in the state after the deadliest terror attack on a CRPF convoy Thursday evening. 2.35pm: Pakistan High Commissioner to India, Sohail Mahmood, summoned by Foreign Secretary Vijay Gokhale. 2.32pm: IGP Jammu says: "Don't play into the hands of anti-national elements. They want to disturb our societal harmony". 2.24pm: Curfew imposed in some areas of Kashmir, including bus stand, Nawabad, Bakshi Nagar, Peer Mitha, Pacca Danga, Channi Himmat, Janipur, Domana, and Bagh-E-Bahu areas. 2.16pm: The family of CRPF personnel Nasheer Ahmed in mourning at Rajouri; the Jawan lost his life in Pulwama terror attack. 2.13pm: No terrorist from within the country or outside, should be spared, says yoga guru Ramdev. 1.58pm: The government should call for an emergency parliament session and abolish Article 370, says Sajjan Jindal. The government should call for an emergency parliament session and abolish Article 370. Let the country see which party supports this and which doesn't. 1.56pm: Sajjan Jindal, Chairman and MD of JSW Group, says: "It's high time we teach a lesson to the terrorists. We need to end it once and for all." 1.45pm: Punjab Cabinet minister Navjot Singh Sidhu asks whether an entire nation can be blamed for a handful of people. "For a handful of people, can you blame the entire nation and can you blame an individual?...it (the attack) is a cowardly act and I condemn it firmly. Violence is always condemnable and those who did it must be punished." Total 614 terror incidents were reported from Jammu and Kashmir in 2018, in which around 38 civilians were killed. India lost 91 security personnel and killed 257 terrorists. 1.29pm: DGP UP, OP Singh, observes two-minute silence to pay homage to the CRPF personnel killed in Pulwama Attack. 1.26pm: Union Home Minister Rajnath Singh reaches Jammu and Kashmir. He will take stock of the security situation in the state in view of the terror attack. 1.18pm: Locals are protesting in several parts of the J&K against the ghastly terror attack on security forces. 1.16pm: After the Cabinet Committee on Security meeting, the National Security Agency convenes a crucial meeting with top security officials, including DIB, DG R&AW, Special Secretary J&K, senior officials of Army and CRPF. The agencies are likely chalking out a crucial action plan to avenge the terror attack. 12.54pm: India-Pakistan trade: Total India-Pakistan trade has increased marginally to USD 2.41 billion in 2017-18 as against USD 2.27 billion in 2016-17. India imported goods worth USD 488.5 million in 2017-18 and exported goods worth USD 1.92 billion in that fiscal, reported PTI. 12.50pm: What is MFN status, and how will it affect Pakistan? India granted the MFN status to Pakistan way back in in 1996, but the neighbouring country has not yet reciprocated. The MFN status was accorded under WTO's General Agreement on Tariffs and Trade (GATT). Both India and Pakistan are signatories to this; and are members of the World Trade Organisation (WTO), which means they have to treat each other and the other WTO member countries as favoured trading partners in terms of imposing customs duties on goods. Removal of this status means India can now enhance customs duties to any level on goods coming from Pakistan, a trade expert told PTI. 12.46pm: Himachal Pradesh Chief Minister Jai Ram Thakur has announced Rs 20 lakh compensation to the family of CRPF personnel Tilak Raj who lost his life in Pulwama Attack. 12.13pm: Former PM Manmohan Singh says: "The Congress party stands in full support of our jawans and their families. We will do all that is necessary to keep this nation united." 12.11pm: "The entire opposition will stand together with our jawans and our government," says Rahul Gandhi. 12.11pm: "This is a terrible tragedy. This type of violence done against our security forces is absolutely disgusting. The aim of terrorism is to divide this country and we are not going to be divided," says Rahul Gandhi. 12.08pm: Former PM Manmohan Singh and Congress President Rahul Gandhi address media on terror attacks in Pulwama. "Today is the day of mourning. ...we shall never compromise with the terrorist forces." 11.51am: Five suspects have been detained in Avantipura town of Pulwama. 11.37am: "Our party strongly condemns this terrorist attack, says BSP chief Mayawati. 11.21am: "If our neighbour which is totally isolated thinks it can destabilise India through its tactics and conspiracies, then it is making a big mistake," says PM Modi. 11.18am: "I thank all the nations who have supported us and condemned this incident in the strongest of terms. A strong reply will be given to this attack," says Prime Minister Narednra Modi. 11.12am: "If our neighbour which is totally isolated in the world thinks it can destabilise India through its tactics and conspiracies, then it is making a big mistake," says PM Modi. 11.07am: Prime Minister Narendra Modi says the "security forces have been given full freedom" to take a punitive action against the terrorists. 10.58am: Prime Minister Narendra Modi observes two-minute silence for the CRPF personnel martyred in the Pulwama terror attack. 10.54am: India will ensure complete isolation of Pakistan at global level, says Finance Minister Arun Jaitley. "The 'most favoured nation' status which was granted to Pakistan, stands withdrawn." 10.46AM: The Prime Minister of Bhutan says his country's prayers are with the grieved families. Deeply saddened by the news of the horrific terrorist attack in Kashmir. Bhutan strongly condemns terrorist attack of any nature. Our prayers are with the grieved family and we are following the situation closely. 10.39am: Former army chief and Minister of State VK Singh says the government's action against the terror attack would be a well thought of decision. "It will be well thought of. What you do must have result. It is a very sad incident. Each incident in Kashmir is sad. Each incident tells you what needs to be done People on ground will come up with appropriate response," he says. 10.38am: The Yogi Adityanath-led Uttar Pradesh government announces an-exgratia of Rs 25 lakh to the families of the 12 CRPF jawans from the state who were killed in the Pulwama terror attack. 10.30am: Sudhar Jaao Warna Sudhaar Denge (mend your ways or you will be taught a tough lesson), says cricketer Virender Sehwag. 10.14am: Indian Air Force C-17 will carry the mortal remains of CRPF personnel killed in the Pulwama terror attack. 10.10am: Russian President Vladimir Putin on the Pulwama terror attack: "We strongly condemn this brutal crime." 10.08am: The NIA team rushes to the Pulwama terror attack site; the entire blast attack area has been cordoned off by security officials. 10.05am: Some latest visuals from the Pulwama attack site. 10.00am: "The cowardly enemy will NOT weaken our resolve. We WILL wipe out every terrorist from the country," says Minister of State Rajyavardhan Rathore. The cowardly enemy will NOT weaken our resolve. We WILL wipe out every terrorist from the country. We mourn the braveheart martyrs, and stand with their families in this difficult time. 9.57am: The government has issued an advisory for the private media channels in wake of the terrorist attack in Pulwama. 9.56am: Former Army Chief Bikram Singh says it shows the emboldened instance of local terrorists. 9.49am: Defence Minister Nirmala Sitharaman, Home Minister Rajnath Singh, NSA Ajit Doval have also arrived at PM Modi's residence at 7, Lok Kalyan Marg for the Cabinet Committee on Security meeting. 9.45am: Who is Adil Ahmad Dar? Reports suggest the 22-year-old Jaish-e-Mohammad terrorist who rammed his SUV on the CRPF convoy that killed 44 jawans lived just 10km from the attack site. 9.30am: Congress chairperson Sonia Gandhi says she was outraged by the "barbarous attack" on the CRPF convoy in Jammu and Kashmir and expressed hope that those responsible for it will be brought to justice. "My heart goes out to the loved ones of each and every victim. I share their grief and pain with all my heart. I sincerely hope that those responsible for this dastardly terror attack will be brought to justice and made to pay for this appalling act, that goes against every tenet of humanity," the former Congress chief said, reported PTI. 9.25am: Arun Jaitley has resumed the charge of Union Finance Minister days after he had handed over the responsibility to his ministerial colleague Piyush Goyal. Jaitley had gone to the US to received medical treatment. He will be present during the Cabinet Committee on Security meeting at Prime Minister Narendra Modi's residence. Army Chief General Bipin Rawat will also be present during the meeting. 9.20am: In wake of the terrorist attack in Pulwama, Prime Minister Narendra Modi and the Bharatiya Janata Party (BJP) cancels all political programmes for today. 9.18am: The Minister of External Affairs statement on the Pulwama terror attack: "The Government of India is firmly and resolutely committed to take all necessary measures to safeguard national security. We are equally resolved to fight against the menace of terrorism. We demand that Pakistan stop supporting terrorists and terror groups operating from their territory and dismantle the infrastructure operated by terrorist outfits to launch attacks in other countries." 9.17am: India has called the international community to support India's bid to ban Masood Azhar at the United Nations Security Council (UNCC) in the wake of the dastardly attack in Pulwama in Kashmir. 9.15am: Sibghatullah Ahmadi, Spokesperson, Ministry of Foreign Affairs of Afghanistan, says his country expresses its "condolences and sympathy with the people and the government of the friendly country India". 9.09am: Pakistan's foreign office issues a statement, saying the attack in Pulwama is a matter of grave concern. "We strongly reject any insinuation by elements in the Indian media and government that seek to link the attack to Pakistan without investigations." 9.08am: "Jaish-e-Mohammed has carried out this terror attack. We assure the country that we will undertake whatever it takes to avenge this," says Rajnath Singh. 9.03am: Massive anti-Pakistan protests rocked Jammu and Kashmir's winter capital on Thursday night. Raising anti-Pakistan, anti-terrorist slogans, the protestors demanded action against Pakistan for "sponsoring terrorism in the Valley." 8.50am: Some latest images from the Pulwama Terror Attack site in Jammu and Kashmir. 7:55am: US condemns Pulwama attack, asks countries to not provide safe haven to terrorists. United States has strongly condemed the terror attack by Pakistan-based Jaish-e-Mohammed in Pulwama and asked the countries to deny safe haven and support for terrorists. Pakistan Foreign Office spokesperson Mohammad Faisal said, "We have always condemned heightened acts of violence in Valley."